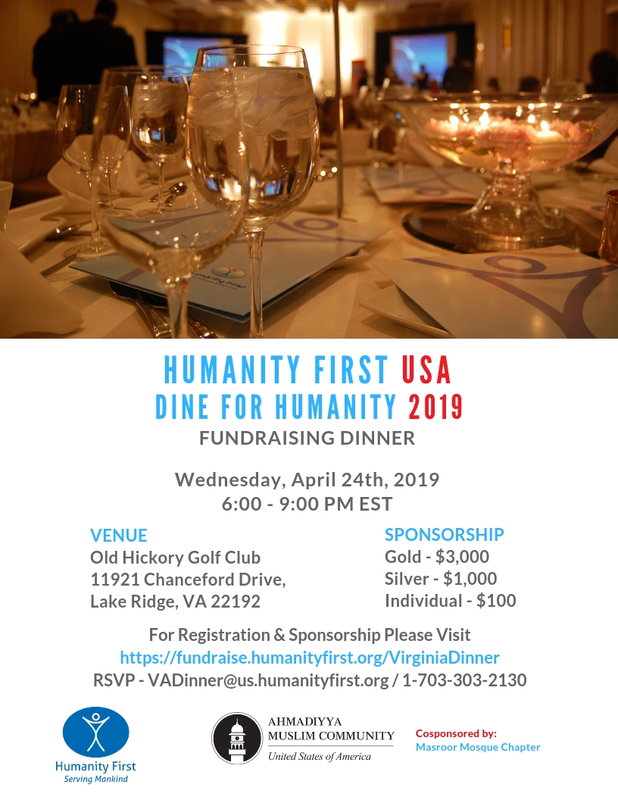 Ahmadiyya Muslim Community from Masroor Mosque is co-sponsoring a Fundraising Dinner for Humanity First USA. Humanity First USA is a 501(c) (3) non-profit organization established in the U.S. in 2004. Food Security, Water for Life, Global Health, Gift of Sight, Knowledge for Life, etc. are some of the ventures by Humanity First USA within the country and internationally. Globally, Humanity First was first established in 1994 in the UK and is now registered in over 50 countries across six continents. Their volunteers have been there to help after many international disasters. Closer to home, Humanity First USA has responded to many major disasters in Texas, Florida, Louisiana, North Carolina, Georgia, and Puerto Rico. Our goal is to raise $35,000 for Humanity First USA for various projects in areas of Human Development and Disaster Response. Please join us to celebrate serving humanity! Email [email protected] to Buy tickets, Donate and for Sponsorship info.